Escapebrfrom the cold this winter to these popular destinations with all-inclusivebrresorts—accommodations, meals, drinks, and entertainment included in one price. DominicanbrRepublic – Popular for its affordability. Beautiful beaches andbrgreat all-inclusive resorts for families and friends such as Now Larimar andbrHard Rock Punta Cana. Mexico-RivierabrMaya – Foodies take note. 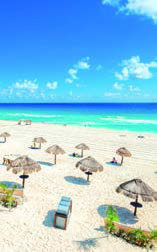 Karisma Resorts, GIC ( ourmetbrInclusive) offering family-friendly Azul resorts and ElbrDorado adult-only resorts. Jamaica-brNegril offers the best beaches in Negril, Couples resorts forbrCouples Only or Beaches and Azul for families. CostabrRica-Guanacaste Area – Something different exploding with beautiful all-inclusive resorts forbrfamilies such as Dreams and for adults at Secrets Papagayo. Southwest has justbrexpanded their service to Costa Rica. CabobrSan Lucas – Travel where the celebrities go – Golf, fishing ,brnightlife, true Mexican vibe at this upscale destination for everyone. New/refurbishedbrall-inclusive resorts such as Dreams Los Cabos Suites Golf Resort and Spa. Forbrmore information, contact Debbie Johnson at Experience Travel by emailing debbie@experiencetravel.biz or by calling (603) 224-6519, or by visiting her website at www.experiencetravel.biz.